Software Used Images Plus 4.0 for camera control, calibration, stacking, digital development, and multiresolution smoothing. Photoshop CS5 used for flat fielding, levels and curves, combining and masking images, color balance, high pass filter, star shrinking, saturation adjustments, and noise reduction. Carboni Tools for additional saturation adjustments and noise reduction. Notes This is the second time I've imaged M42. This version represents a big improvement over last year's version and is the first time I composited images (combining more than one image to make a single image). 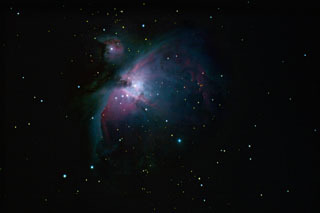 While M42 is very bright and easy to image, it has an extremely wide range of brightness levels (high dynamic range). Because of this, its not possible to capture the faint outer regions without dramatically overexposing the interior. Conversely, if you expose for the interior regions (the Trapezium), you won't capture the faint outer nebulosity. In this image, I combined 15, 30, and 180 second exposures. By layering these images together and using some masks, I was able to maintain details from the inner core to the outer edges. I believe the technique worked very well, and I'm quite proud of this astrophoto. 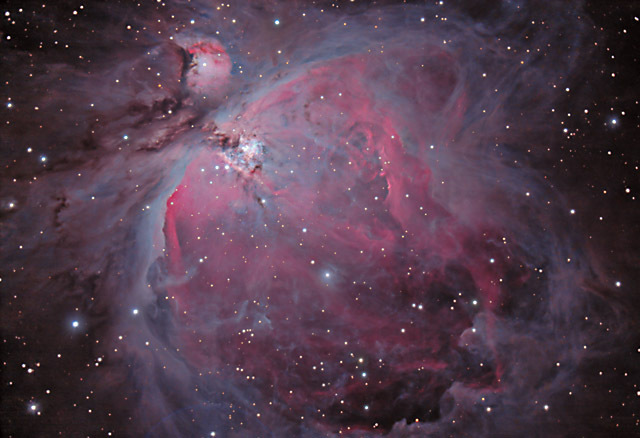 The earlier version of M42 is HERE. This image won 1st place in the Digital Astro Challenge for January 2012.